Data graphic created from the Institute for Health Metrics and Evaluation web app showing the number of years people with chronic kidney disease live with their disability after diagnosis. Yet another online flu web-page view correlation…. There are some notable caveats to making conclusions about the data, which have been extensively outlined by docgraph.org. Problems such as payer mix and specialty bias should be considered. For example, pediatricians will have many fewer Medicare patients, while specialties with patients 65+ or special Medicare programs, such as Nephrology (Disclosure: this my sub-specialty), may have a higher proportion of Medicare insured patients. Analysis of varying payment amounts for similar procedures – Because the same medical procedure can be billed on several different codes that account for the complexity of care provided, there is the opportunity for the “Lake Woebegone Effect” – where all the procedures have above average difficulty. In some cases it might be true that a particular physician specializes in the most difficult cases (e.g. advanced chemotherapy using an implantable pump for liver cancer), but this is the exception rather than the rule. Network analysis of unusual billing patterns -Here is where coupling this database with DocGraph (see my previous post here), a network graph database of all the referral patterns for Medicare for all US patients, may yield very interesting findings. Some networks of physicians may have unusual billing patterns compared with others. In some cases, this will be a sign of efficiency and great medical care delivery. In others, it may be a sign of inefficiency or, in rare cases, something more ominous such as a pattern of fraud among a group or organization of providers. Network analysis of procedure frequency – More useful, will be the ability to study types of procedures and visits among providers in different geographic areas, and the reimbursement variations. Already, USA Today has posted a map of average reimbursement by state. While some sophisticated analysis will be needed to reach thoughtful conclusions about regional variations in care, this will certainly spur a great deal of analysis and hopefully some good healthcare policy. So, a good day for data transparency in healthcare delivery, and I say that as somebody whose Medicare practice is in the database! Let’s hope that high quality data analytics with thoughtful research follows. 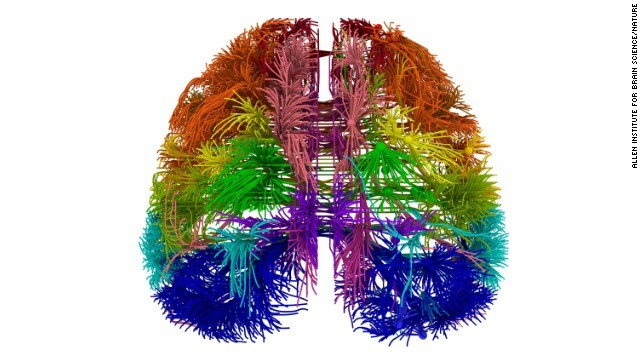 This week, a mesoscale-connectome of the mouse brain, Merk uses Hadoop to optimize vaccine production, hospitals turn to big data to reduce re-admission rates, another philanthropic gift for data science. There is tsunami of new devices and apps out that will help you record everything from the number of steps you took in a day to calories and caffeine ingested, sleep quality, weight, blood pressure and blood glucose levels. The next revolution in Medicine will be the Internet of Medical Things (IoMT), uniquely tagged devices that help monitor blood pressure, blood glucose, physical activity, temperature, sleep, and even motion. Along with patient entered data from tablets, mobile devices, and conventional desktop computers, data from these devices will change the face of medicine, increase our ability to engage patients in their own health behaviors, and provide massive amounts of data for population health study on an unprecedented scale. Personal biosensor devices (PBD’s) like Fitbit and Jawbone have become the rage, with many corporations looking to provide PBD’s to employees, with the goal of improving employee health. Often the devices are paired with financial incentives to motivate people to change behavior. As reported last year in Wired, company +Citizen has a program where employees have voluntarily agreed to share their fitness, productivity and happiness data. Many vendors, such as FitLinxx, SparkPeople, and Endomondo specifically offer employer packages. Mobile apps are branching out, and rapidly linking with these devices, allowing coupling of geospatial and biometric data. The data to be generated by these devices, already in use by hundreds of thousands, if not millions of people, will be staggering. This past year, clinical research and clinical trials started to incorporate PBD data from smart phones and PBD’s. At present, it is unclear whether apps or PBD’s will alter health behavior. Despite their ubiquity, there is little data on improvement in glucose control by diabetics who use such mobile software to manage their blood sugars. Do weight loss and calorie counting apps really achieve their goals? I think that it’s fair to say that anectdotal evidence suggests great promise in many cases. From a personal standpoint, my Fitbit has made me more aware of my sedentary computer habits, and motivated me to take more steps and run out more. My favorite recent awareness raising app, pointed out to me by my colleague Joshua Schwimmer, is UpCoffee by Jawbone. I had no idea of the half-life of caffeine before I downloaded the app! The impact of PBD’s and apps may not be all good, or all predictable. Sometimes, personal bio-sensing apps can actually lead to bad outcomes. An article by Alice Gregory in the New Republic last year describes how calorie counting mobile fitness apps can worsen eating disorders. Given the studies that have described the addictive properties of electronic devices and the internet, and the underlying biology, it is not surprising that these problems can be exacerbated in people with addictive or compulsive behavior tendencies or illnesses. Where all this leads, we don’t know yet. Certainly to very large data sets and something far beyond telemedicine. Something exciting is happening in medicine and research. I hope that this will lead to the ability to crowdsource population health research questions and studies beyond our wildest imagination. What would you study if you had access to data from a million PBD’s?